AMI POLYMERS was established by Vipin Patel and Manoj Akkad in 1978 at Ankleshwar GIDC in India. 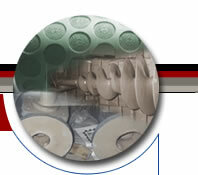 Ami Polymers is a Licensed Industrial Applicator (LIA) of DuPont, USA. AMI POLYMERScarries out coatings of Fluoro-polymers like Teflon(PTFE), Kynar, Tefzel, Halar PFA etc. on variety of equipments or components for industrial end use applications. The Company is also carrying out coating of Teflon on various consumer products such as Aluminum Tawa, Fry Pans etc. In our group company M/S Zen Engineers Pvt. Ltd. we manufacture highest quality consumer utensils. The team is supported in their functions by Shilpa Shetye, the Quality Assurance Manager and experienced engineers and technicians for process, tool and equipment development activities. A Licensed Industrial Applicator (LIA) of Du Pont is a company having trained people experienced in selection and application of "Teflon" coating. As LIA, we are familiar with the latest technological developments in the field of Teflon Coating and maintain stock of many grades of Teflon Coating raw materials. By bringing insight into the properties, manufacturing process and end use application of various grades of Teflon Coatings, we are a valuable resource for companies during the initial stages of product development. We help select the coating system, set the manufacturing process and establish quality assurance system for a given application. Pharmaceutical Industry and Chemical Process Industry Vessel, Agitator, Centrifuge basket, Dryer etc. Petrochemical Industry Nuts & bolts, Agitators, Heater Bar, Pipe, Spool, Bends. Textile Industry Guide Rolls, Sizing Cylinders, and Jet dying baskets. Rayon Industries Chutes, Barrettes etc. Electrical Industries Coating of electrical switchgear parts prone to atmospheric corrosion. for making thin crust Pizzas. Moulds for making Garlic bread and buns. These products are not only shipped all over India but are also exported to Mauritius, Bangladesh, Sri Lanka, Nepal etc. to the needs of the original equipment manufacturers (OEM) . We have all the facilities and instruments for surface preparation, coating and for measuring thickness, resistance to corrosion, porosity checking etc. Zen has Deep Drawing Press, CNC Punching Machine, Vacuum tool polishing machine,riveting machine etc. Ami Polymers has made India as only the fifth country in the world to Teflon coat very large size reaction vessels. The biggest vessel we coated was 8.1 meters in height and 6.1 meters in diameter with a weight of approximate 30 tons. Today we consume nearly 300 tons of Aluminum and our capacity is more than 240000 pieces of highest quality utensils. We are driven by our belief in providing world class services and quality to our customers. We know that our customers have choices. So, we compete with ourselves and are committed to be always evolving and be the best in the Industry. Our activities are diverse and in all of them we specialize in catering to the needs of original equipment manufacturers (OEM). This attitude has led us into more and more product lines. We use all our entrepreneurial skills, commitment and stringent quality control in every project that we undertake. Come to us, talk to us for a probable solution to a sticky problem. You will be happy to realise that you are in good hands.